Featuring insights from individual contributors from all corners, nooks and crannies of the Columbus, Ohio, region, Scott McComb, President & CEO of Heartland Bank, has a goal to get to the why of our evolving and eclectic environment. 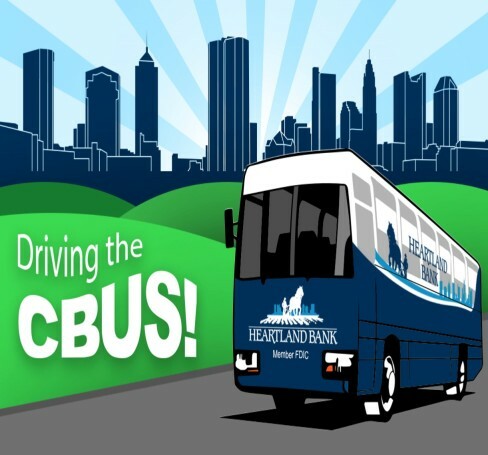 Check back often for updates to the list of the latest interviews with some of the area's most interesting individuals who are 'Driving the CBus'! Joel Riley, 610 WTVN, steps up to the mic on this episode of Driving the Cbus to talk us through his lifelong career in radio and his perspective of the growing metropolis that is Columbus. Scott sits down with Kenny McDonald, Chief Economic Officer of Columbus 2020 to talk about where Columbus has been and where it is going - possibly at hyperloop speed. On this episode of Driving the Cbus, Scott is joined by Bea Wolper, President of Emens & Wolper Law Firm, Columbus, Ohio, to discuss the do's and don't's of passing the family business down to the next generation. Randy Malloy, owner of CD 102.5, sits down with Scott to share his insights on independent radio, and how it has rocked the Columbus music scene since 1990. Kip Morse, President & CEO of the Better Business Bureau of Central Ohio, joins Scott to discuss the consumer experience in Columbus as well as the importance of business ethics in the city.